UP BTC 2018 (Basic Training Certificate) is now replaced by UP D. EL. Ed (Diploma In Elementary Education). This Examination is conducted by the Uttar Pradesh Basic Education Board. It is expected that the Application Forms will be available in the month of May 2018. The Exam is conducted for all those eligible and interested candidates who want to get admissions in Diploma in Elementary Education. This article is all about the UP D. El. Ed online Application Form and other details related to the Examination. Latest Update: UP D.El.ED (BTC) Online Application Last Date Is Extended Till 31 May 2018…..Get the Detailed Info. through The Image Given below…. Please Read all important instructions before apply online. The Uttar Pradesh Government will soon the notification for UP D. El. Ed Admission 2018. The D. El. Ed Admission is for 2 Years UP BTC Program. The Application Forms will be available soon. This is an Entrance Examination for the Admission in Diploma in Elementary Education. Through the UP D. El. Ed candidates can get admissions in Private Colleges, DIET and colleges in Uttar Pradesh. The minimum age of the candidate must be 18 years and the maximum age of the candidate must be 35 years as on 1st July 2018. Age Relaxations will be applicable to the Reserved Category candidates as per the Government Norms. 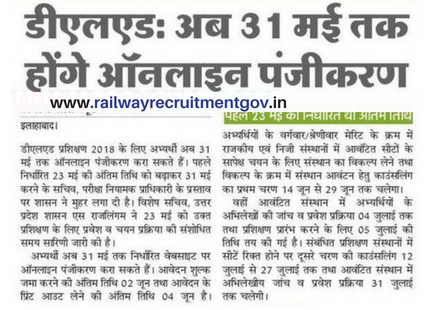 The applicant must be a permanent resident of Uttar Pradesh. Candidates must have a Bachelor Degree from any State or a Reputed University. Candidates can pay the UP D. El. Ed Application Fees through Online Mode. Candidates can pay the Application Fees by Debit Card/ Credit Card/ Net Banking. The Application Fees is exempted for Physical Handicapped candidates. Search for UP D. El. Ed Application Form. Fill in all the details and upload all the required documents. After filling the complete details, click on the “submit” button. Pay the UP BTC Application Fees. Download and Save the Application Form until the completion of the Admission Procedure. Candidates can visit our website to get the latest updates and notifications regarding the UP D. El. Ed Admission Procedure 2018.